Note: Packstack deployments are intended only for testing environments, and are not suitable for production. For more information, see https://access.redhat.com/articles/2477851. Note: For the Red Hat OpenStack Platform 5 version of this guide, see https://access.redhat.com/articles/1146173. A private network, subnet, and router are created in the project. Configuring security groups (firewall settings) to allow incoming ICMP and SSH connections for the instance. Testing the SSH connection to the instance. As a result of these steps, all ingress/egress network traffic is bridged to the physical network infrastructure. 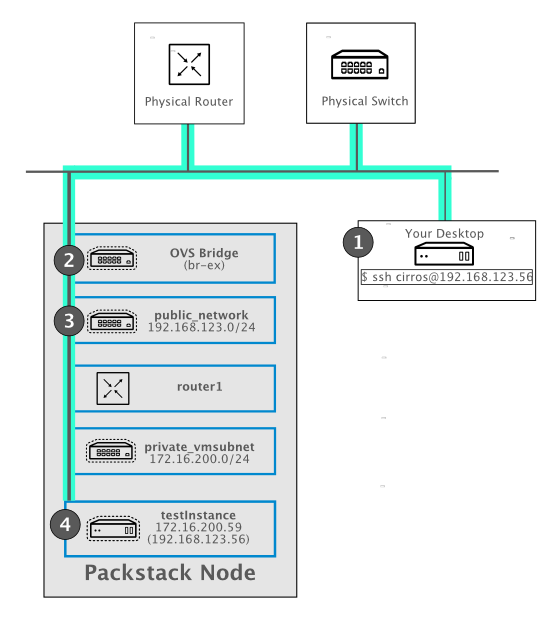 In addition, this particular all-in-one configuration is intended for a single node deployment; as a result, the networking type is set to local, and does not make use of VXLAN or VLAN networking. 1. You open a SSH connection to the instance's floating IP address: 192.168.123.56. 2. The SSH connection travels over your physical infrasctucture, and reaches the br-ex bridge, which is mapped to the physical ens33 NIC. 3. The SSH connection reaches the public network connection that hosts the 192.168.123.56 IP address. From here, NAT is used to map this IP address through to the actual IP address configured on the instance (172.16.200.59). 4. The SSH connection passes through the virtual router1 and arrives at SSH port 22 on testInstance. Your lab is running on a self-contained subnet (192.168.123.0/24), and you are permitted to enable a DHCP service for it. Your lab has internet access. Note: You can open the Network Topology tab in horizon to observe the results of the following commands. Make sure you have selected the network-demo project in the dropdown list. The command below generates a keypair and adds it to the nova service. The resulting sshaccess.pem file contains the private key, which can be presented when attempting to SSH to the instance. Note: If you get an ERROR status, check /var/log/nova/nova-conductor.log. If the log has an entry saying No valid host was found, confirm that your system has sufficient RAM available to host the instance. You can check your available ram with free -h. Sometimes just a reboot can help. A floating IP address allows an instance to receive incoming network traffic from external networks. The guest OS of an instance is configured with an IP address that is accessible only to systems within that subnet; systems that are outside the subnet will contact the instance using the floating IP address that has been assigned to it. The floating IP address is not configured within the instance guest OS. Instead, the floating IP address is mapped to the instance's IP address using NAT. In the following procedure, a floating IP address is created and associated with the instance's network port. The authenticity of host '192.168.123.56 (192.168.123.56)' can't be established. Warning: Permanently added '192.168.123.56' (RSA) to the list of known hosts. Note: If not using cirros, you might need to specifically enable SSH in your instance's guest OS. The default gateway IP address will need to be situated on the same subnet as your instance. At least one DNS server will need to be specified in the instance's interface settings for name resolution to work. I believe this would be the best option for 10 as well. Thanks a lot Jeff, Spent 2 days to figure it out and finally found your comment and it works for my RHOSP13! After I run packstack, the openstack servers networking no longer works. I cannot ping it from a remote server. In my case I am using eth0. I can ping it from the command line of the openstack server.